We are equipped with a Cuattro Slate high-definition portable digital x-ray system. This new diagnostic tool allows us to acquire superior images and instantly review them stall side throughout our service area. Patients will benefit from faster diagnosis and the ability to more quickly pursue the appropriate treatment. This machine includes the newest software available for evaluating hoof angles, sole depth, and other measurements to aid in therapeutic shoeing. Images can be easily copied for client records and instantly uploaded for review by a specialist when needed. Digital copies of x-rays are provided via an email link or a custom USB drive. 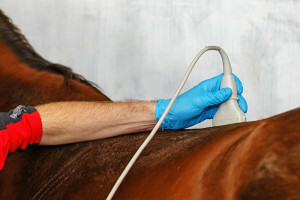 Lameness Exams – Ultrasound offers additional information on tendon damage and lesion progression. Colic – Ultrasound allows us to evaluate intestinal thickness and is becoming increasingly useful in determining surgical or medical colics. Ophthalmic (Eye) Exams – Ultrasound is helpful in evaluating the back the eye including the lens and retina. Our practice features a state-of-the-art hematology and blood chemistry lab that includes equine fibrinogen analysis. Immediate access to results allows us to initiate treatment without delay. Our in-house lab is equipped to process Complete Blood Counts and Serum Chemistry analysis on horses, cows, goats, sheep, pigs and llamas. Referral Laboratory Testing – Specific testing is carefully referred to the most appropriate university, federal, state, or private lab on an individual basis, as determined by doctors, for the most valuable and accurate test results. Our veterinarians are accredited by the USDA and are therefore able to provide Coggins testing, health certificates, and Canadian export for horses. Brucellosis vaccination, testing, and certification are available for ruminant herds. Tuberculosis testing and accreditation of ruminant herds are also available. Our Coggins tests include a professional, clearly typed form with digital photos to identify your horse. Test results can be expedited for a fee, with results delivered in 24 hours. Otherwise, results are generally available in 72 hours. Official paper copies are provided to trainers, barn managers, and owners unless otherwise noted. Digital copies can also be provided.